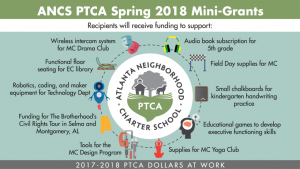 One of the initiatives the ANCS PTCA is proudest of is the Grant Program. The money we raise provides needed funding for programs, activities, and materials that enhance students’ experiences at the school. We encourage all members of the community to submit Grant applications (all applicants must belong to the PTCA). Applications for the third round of PTCA Grants are due Friday, April 12th. Decisions will be made at the PTCA Board meeting on Monday, April 15th.